Are you experiencing Mountain excitement? Good news! Apple hasn't run out of cats! Mountain Lion, announced today, will ship this summer and make OS X even more iOS-y than ever before. That's bound to annoy some purists, but I think the majority of Mac users will be delighted. Apple promises that there's more fun stuff to come, but what's already been announced ticks some of our wish list boxes, particularly iMessage on the desktop. There's a new Safari, AirPlay mirroring to Apple TVs, Twitter integration and the option to disable non-approved apps - handy if you've got kids - and you get the same Reminders and Notes apps that you get on iOS, enabling Mail and Calendar to concentrate on what they're supposed to be concentrating on. What's really interesting about it isn't the iOS-ification of OS X, though. That's been obvious since the Back to the Mac event in late 2010. The interesting bits of Mountain Lion are iCloud and Game Center. Mountain Lion's iCloud integration effectively delivers the kind of cloud-based OS Google's been promising for ages with Chrome OS, and it'll do so with user numbers Google's notebook OS can only dream of. It may well beat Windows 8 to market too, in which case the much-heralded SkyDrive integration and Windows Live ID sign-in will look to Mr and Mrs Punter as if Microsoft's been at the photocopier again. I'd imagine Apple finds that quite funny. And then there's Game Center. By bringing it and AirPlay Mirroring to the Mac, Apple's making some interesting gaming-related moves: cross-platform multiplayer, in-game voice chat and display mirroring - not to mention the ability for developers to create titles that work on iOS and on OS X - indicate that Apple's starting to take gaming very seriously indeed. 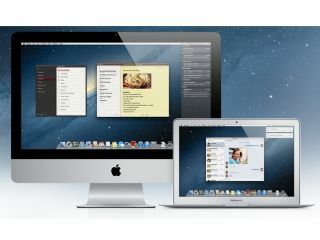 While Mountain Lion is a stand-alone OS, it isn't designed to stand alone: it's a gateway to iCloud and part of the wider Apple ecosystem. The vision here is simple: your stuff, on whatever device you happen to have handy. That device could be a Mac, or it could be an iPod touch, iPhone, iPad or an enormous HDTV with an Apple TV tucked underneath it. It's personal computing with the emphasis on the personal, not the computing.